We know there was a Rector here in 1249, so there would have been a church here then too. The nave, the oldest part, was probably built then, not long after Magna Carta was sealed.Some 250 years later (~1500) the church was enlarged by adding another aisle, the Porch and the Tower. 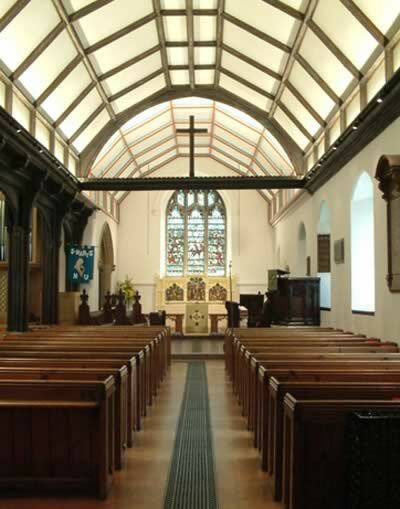 To add the North aisle, one wall had to be demolished and, to hold up the roof above, the most distinctive feature of the church was erected – the wooden columns forming an arcade. This, though not unique, is very rare. Each column was hewn from a great oak tree. The splendid porch, tower and shingled spire were also built in the 15th century. 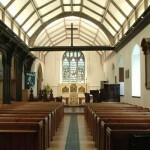 In the 19th century, a new chancel was added on, with the existing one becoming part of the nave. In the 20th century, two new Vestries were built on for use of the Ministers and the Choir respectively. Which Diocese do we belong to? 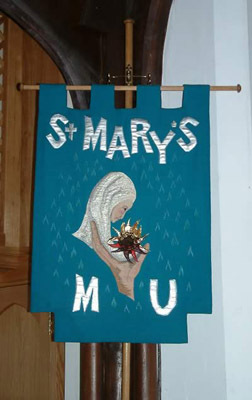 St Mary’s was originally a member of the Diocese of London, but subsequently it was transferred to the Diocese of Rochester, then the Diocese of St Albans and finally to The Diocese of Chelmsford. There are four small shields bearing the coats of arms of each of the Dioceses on the wall of the organ facing the altar.